Salivary secretion is regulated by mainly neural mechanism. It shows both conditioned and unconditioned reflexes. Conditioned reflex is established by learning and the secretion of saliva can be seen from sight, smell and thought of food. The unconditioned reflex comes from the presence of food in the mouth. The secretion of saliva in both types of reflexes is caused by the activity of parasympathetic nerves (VII and IX cranial nerves) supplying the gland. The enzyme α amylase acts on boiled starch and converts it to maltose. 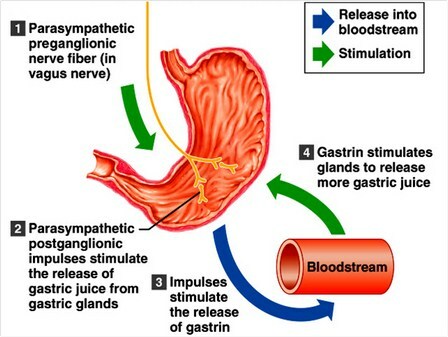 Thus carbohydrate digestion begins in the mouth. the mucin present in the saliva lubricates the food, which helps mastication. Saliva is necessary for swallowing of food. It helps in taste perception of food materials by dissolving them. It facilitates speech and in dry mouth speech will be difficult. Saliva is the route for the excretion of heavy metals like lead, mercury, drugs and virus. The proline rich proteins present in saliva protect the enamel and in its absence as in low secretory rates, dental caries are common. It neutralizes the gastric acid that refluxes into the duodenum and relieves heartburn.